Perfect in the office or shop, this convenient table will lift, position, and transport loads up to 2,200 lbs. Steel platform with rust-resistant construction. Manually operated unit has a easy-to-operate foot pump and safety overload valve. 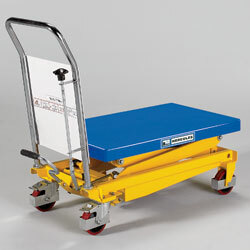 Rolls on polyurethane casterstwo rigid, two swivel with brakes. All casters have safety covers. Also includes plastic protective shields inside the handle and a maintenance stop pin that prevents platform from falling during service. IN STOCK. YC-1200 4"	 17.7 x 27.6"	 82	 330	 4"	 8.628.8"	 8.6"28.8"	 17.7" x 35.5" x 34.3"	 17.7 x 35.5"
YC-1201 5"	 19.7 x 32.5"	 163	 660	 5"	 14.635.5"	 14.6"35.5"	 19.7" x 42.9" x 36.6"	 19.7" x 42.9"
YC-1202 5"	 20.1 x 35.6"	 249	 770	 5"	 13.651.2"	 13.6"51.2"	 20.1" x 45.3" x 37.6"	 20.1 x 45.3"
YC-1203 5"	 19.9 x 32.3"	 185	 1,100	 5"	 14.635.5"	 14.6"35.5"	 19.7" x 42.2" x 37"	 19.7 x 42.2"
YC-1204 6"	 20.1 x 39.4"	 262	 2,200	 6"	 16.439.4"	 16.4"39.4"	 22.9" x 53.2" x 39.4"	 22.9 x 53.2"